Camden, NJ is in the midst of a resurgence. The momentum is palpable. City, business, and community leaders are implementing strategies to improve Camden's economy, education system, housing, public safety, and infrastructure. The Trust for Public Land has joined the movement to help Camden residents create the high quality neighborhoods they envision for themselves by creating vibrant green spaces. When properly designed with community input, parks provide substantial benefits, improving community health, supporting education and green jobs, and providing environmental benefits. For example, when rainstorms roll over Camden, residents look nervously to their drains. Situated along the Delaware River, the City's aging sewer system tends to overflow in heavy storms, inundating streams, streets, and even homes with putrid floodwater. 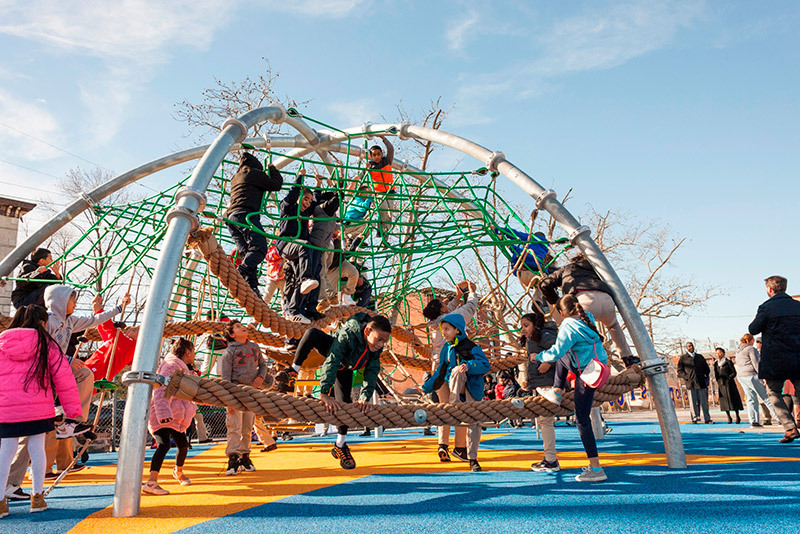 Not only will we make parks that feature gardens and other green infrastructure to absorb downpours and reduce the risk of flooding in schools and homes, but these dynamic public outdoor spaces will also be for play, learning, and togetherness. Dominick Andujar Park: Dominick Andujar Park spans a full city block, and is located along the route of a regional trail network known as the Circuits Trail. Large swaths of deteriorating asphalt in the space have created uninviting conditions for use. Our proposed design will boost the ecological health of the park by adding features that absorb stormwater and cool surrounding temperatures, while enhancing its recreational amenities. Cooper's Poynt Family School: Cooper’s Poynt Family School is a public elementary school. The school's playground was primarily an asphalt lot with little built-in play features. The school's teachers were eager to provide a place for students to play, exercise and learn, so with help from partners, it was transformed from barren to bold, with colorful new play equipment and porous pavement. The first phase of the new playground opened in early December 2018, and rain gardens, basketball courts, and an outdoor classroom are slated to be installed in 2019. Rafael Cordero Molina School: Mastery Charter Schools operates the Rafael Cordero Molina School. The public elementary school is working with us to create improved outdoor learning and play spaces for their schoolyard. The school benefited from new playground equipment in 2009, but persistent stormwater issues have eroded the safety surface below the playground, rendering it unsafe, and much of the schoolyard is unusable because of flooding during rain events. We envision an improved play area and a rain garden with new opportunities for hands-on outdoor learning. The Benjamin Franklin Bridge: The Benjamin Franklin Bridge is the primary gateway between Philadelphia and Camden. For every inch of rain that falls, an estimated 1.8 million gallons flow from the bridge deck through a series of downspouts, inundating Pearl Street and the already taxed sewer system. Our vision is to capture roadbed runoff through green infrastructure systems to alleviate flooding, improving multimodal transports routes for residents and visitors, while symbolically reconnecting North Camden to Central Camden. Like everywhere we work, great partners are essential to our success. The Camden County Municipal Utilities Authority invited us to collaborate with them on stormwater issues in 2015, recognizing what we had already accomplished in Philadelphia and Newark. With the support of The Camden City School District, we are now working to green schoolyards in the city. Coopers Ferry Partnership in the City of Camden leads and organizes the long-term overarching redevelopment plans; we come alongside their efforts offering support and capacity on park and open space strategy. The Honorable Mayor Frank Moran declared his commitment to our 10-minute walk to a high quality park for all campaign early in his tenure. With the four projects underway and growing partnerships in the City of Camden, we expect to be here for a long time. We anticipate greening more schoolyards, renovating more neighborhoods parks, and leveraging our organizational expertise to undergird the other investments being made in the City's resurgence. You can be a part of our work and our impact. When you subscribe to our email newsletter, we will send you monthly notes detailing the latest on our activities to create parks and conserve land, both locally and across the nation. When you make a contribution, your gift will support all that we do to deliver great outdoor spaces to the people who need them most. When you send a note to Samantha.Piccolo@tpl.org, let us know what you think and ask us questions, we look forward to it. When you share this page, you help us connect with others excited about our work. Of course, we do social media too. How are you involved with The Trust for Public Land?